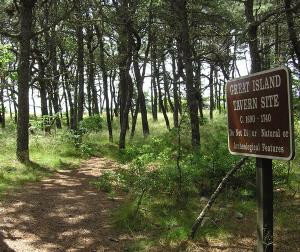 The Cape has numerous nature trails to walk and enjoy, from the many different conservation lands in each town, to the bike trails (Shining Sea, Cape Cod Rail Trail, Nickerson, the National Seashore, or the Cape Cod Canal), to the lands of the National Seashore. Whichever trail you choose to explore, keep these tips in mind. Know what you are signing up for. If you aren't physically able to handle a long or arduous walk, be sure that the trail you want to explore isn't too hard. Many of the bike paths are level, so they are good for those who aren't as able to exert themselves. Watch out for poison ivy. Poison ivy has three leaves, is green, and has a sheen to it. Be sure to avoid it. The best way to avoid poison ivy is to stay on marked paths. Check for ticks. If you will be walking in the woods, it is wise to wear socks and long pants, but if you don't, be sure to check yourself for ticks afterwards. Another good way to avoid picking up ticks is to stay on marked paths and avoid long grass. Pick an area you feel up to. If you want to go to the beach during your walk, go for a walk that will bring you to the shore. If you want to enjoy the woods, pick one of the many wooded areas. Many walks have a nice mix of beach and woods. Also, some walks have great picnicking spots, so if you want to have a picnic, keep that consideration in mind. The Indian Lands Conservation Area in Dennis, for example, has a picnic table. Bug spray and sun protection. When heading out in the summer, bug spray is always a good thing to have on hand, as is sun protection - from sunscreen to a big hat to sunglasses. By being prepared, you'll have a fun, safe and enjoyable hike. Here at Great Island in Wellfleet. Photo by John Fitts.